When Reeni asked me to host the upcoming BSI (blogger secret ingredient) naturally I was flattered as all get out but I had to play it cool and aloof so as not to come off over excited. Well since no one really saw me 'playing it cool' it looks like the cool was spent only on me and naturally the over excitement has passed so now its time to get down to the business at hand and that is picking an ingredient. I am in wonderful company and the previous ingredients were nothing less than excellent, I wish I could get the easy way out and duplicate one but I wont. Did you check out the blueberry extravaganza? All the links are here so go and see and a big CONGRATULATIONS to Katherine at Smoky Mountan Cafe - she walks away with the blueberry bragging rights! Can you believe, to my amazement, that no one has picked one of the most well liked ingredients this world has to offer. Here is the little problem: I will be flying (the whole fam damily) from New York City to Anchorage, Alaska at 8:00 am Sunday morning - I would like to wrap this particular BSI up on Saturday if it is at all possible...normally the secret ingredient is announced on Monday so I am giving a head start as well. I made a little gratin of some eastern potatoes (skin on - I like it rustic) and sliced onion with shrimp. The beauty of the potato is its versatility - the sky is the limit. Good luck and have fun with Potatoes. Guess what? I was contemplating choosing potatoes as the BSI too when I ws host! I'm so surprised it hasn't been chosen as a BSI yet, it is SO versatile! I'll try to submit something in! b-and-s: thanks soph - I know you will do a great job. Have a nice time at Alaska. Great choice! I was waiting in suspense to see what you would chose. I like my skins on too - this gratin looks extra yummy with shrimp. How lucky your family is - did I tell you I'm up for adoption? Great BSI Choice! Can't wait to see what everyone comes up with! Your Gratin is fabulous! I love the dish you baked it in! Congrats to Katherine! Her recipes are always extraordinary! You know what German food are all about? Potatoes and sausages! Ha, as it just so happens that I bought some fingerling potatoes at the farmer's market. Perfect timing!! Excellent -- I have vast quantities of potatoes from my veg box this week. I shall be cooking and sending something in. Yay Potatoes!! Good choice...now what to make? p.s: i started posting my story . hope i see your comment ! I guess I'm having some potatoes soon! Alaska? Wow! Where did that come from- or were you planning it all along? Hey, count me in! I've never participated in any blog event before, so this will be my first. I'm excited. Potato is so underrated. cherri: who is you mom? Gratin looks great--nice addition of shrimp! Have fun in Alaska--can't wait to see pictures!! Cool! I'm from Idaho, so I feel a bit of an obligation to this one! I LOVE Alaska, have a wonderful time! Have fun in Anchorage. Don't get bug bitten too badly. Great choice for BSI ingredient! Love the shrimp addition in a potato gratin! Thanks Christo, I didn't know why I typed 'at', haha.... It's the fault of your beautiful potatoes (juz kidding, LOL). Good choice. That's a fine looking dish of potatoes and shrimp which has succeeded in making me ready for lunch early! 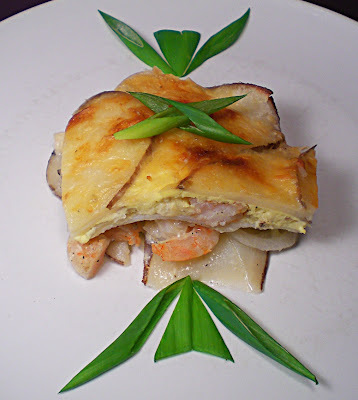 First, thanks for visiting my site...this potato dish with shrimp loos so yummie! Enjoy your trip to Alaska. Gosh that gratin looks inviting! Its gorgeous, doggy! Now, about this BSI ... can anyone enter? Is it too late? Color me clueless on the rules of the game, but it sounds like fun and I might like to play! When are you going to start the recipes? This looks fabulous! I'll miss you while your in Alaska! Gaaah! I posted about the only interesting potato dish I know - Peruvian Causa - about a month ago! Hopefully, I can think of something else in the next couple of days. But hard to beat your gratin - it's lovely! I'm buzzing you again - the Top 9 day isn't over yet! Ive never done this before...How do I post my entry? Is it possible to send in an entry that I posted a week before? I have guests over here(and here I sneak into blogging for few min!!) and I doubt whether I would be making anything with potatoes this week. But I really dont wish to miss your event too! Ooh wonder if I'll have the time. Anyway, hard to beat that great shrimp and potato gratin! Thanks, and have fun in Alaska! Hope you have a great family vacation! Potato shrimp gratin looks yummy. Wish I had the patience to make it. Happy hosting :) and have a great vacation.